These General Terms and Conditions of Access and Use (hereinafter, “General Terms and Conditions”) govern access to and use of this website (hereinafter, the “Website”), which can be accessed at http://www.portaventuraworld.com and is owned by Port Aventura Entertainment, S.A.U. (hereinafter, “PAESA” or PortAventura World). Access to and use of the Website by the user (hereinafter, the “User”) is free of charge, and no prior subscription or registration is required. However, in order to contract for certain services or products through the Website, the User may be required to register in accordance with the terms and conditions set out below and to accept certain specific conditions that implement and supplement these General Terms and Conditions. Access to and use of the Website shall be subject to and, therefore, governed by these General Terms and Conditions, and also by any specific terms and conditions that may apply to certain services included in it. To this end, you are hereby expressly informed that mere access to and use of the Website affords you the status of Website User and entails your full acceptance, without reservations, of all provisions of these General Terms and Conditions and, where applicable, of the specific terms and conditions published on the Website at the time of said access. Consequently, the User should read all terms and conditions carefully and in full each time he or she uses the Website. The specific terms and conditions shall apply to certain products, services and content offered to Users through the Website, access to and/or use of which shall be subject to, and may, in some cases, replace, supplement and/or modify the General Terms and Conditions. If the User does not agree with the content of these General Terms and Conditions, he or she should refrain from accessing and using the Website. The User understands and accepts, by visiting the Website, that the data and information it contains are provided solely and exclusively as preliminary information for the User and that, at any given time, they may contain errors or inaccuracies or be out-of-date. Notwithstanding the foregoing, the provisions of this clause do not affect the content of the offer, advertising or promotion of PAESA's own services; neither in terms of the legal or economic conditions nor to the guarantees applicable to the services offered by PAESA; all this in strict observance of the regulations applicable to the protection of consumers and users. These General Terms and Conditions are effective from their most recent update (indicated at the end of this document). PAESA reserves the right to modify and update the information contained on the Website, its layout and display, as well as these General Terms and Conditions or any specific terms and conditions that may apply, at any time, at its discretion, in which case they will come into force as of their publication and will be exclusively applicable to Users who access the Website after this date. For clarification, in the event that these General Conditions are modified, in strict observance of consumer and user protection regulations, PAESA will respect any commitments and agreements made with Users prior to the modification. The User represents that he or she is of legal age, in accordance with his or her national law, and has the necessary legal capacity to be bound by these General Terms and Conditions, as well as to use and, where applicable, contract for products or services through the Website, in accordance with any specific terms and conditions that may apply. The User represents that he or she is familiar with, understands and accepts all such terms and conditions in their entirety. This Website has been developed for the benefit of the final clients and/or companies. Therefore, the services which can be accessed here may be aimed at one type of client or another, and must in each case fulfil the requirements set out for them. In particular, final clients recognize and accept that the Website is exclusively for their own personal use and confirm that the products or services acquired or contracted via the Website will be for their own use or consumption, and that access, use of or consumption of products and services offered on the Website by third parties accessing, using or contracting in their name, is done under their own name. The User confirms that all information that he or she provides whilst using the Website is true, complete, accurate and up-to-date. The User undertakes to use the Website in accordance with current law, the provisions of these General Terms and Conditions and any specific terms and conditions that may apply, and in accordance with moral standards, generally accepted good practice and public order. The User further undertakes not to use the Website for any purposes or ends that are illegal, that are contrary to these General Terms and Conditions and any specific terms and conditions that may apply, that may harm the rights and interests of PAESA or third parties, or that may in any other way harm, render useless, overload or cause harm to the Website, thereby preventing other Users from making normal use of it. PAESA reserves the right to deny or withdraw access to and/or use of its Website at any time and without prior notice to registered Users who breach these General Terms and Conditions and/or any specific terms and conditions that may apply. PAESA does not guarantee the availability or continuity of the operation of the Website, which may be impeded, hindered or interrupted by factors or circumstances beyond its control. PAESA will take, provided that there are no circumstances that make it impossible or difficult to execute, and as soon as it is made aware of errors, disconnections, incorrect display or breakdowns, all action necessary to correct technical errors, re-establish communication and update the referred content. PAESA states and guarantees that its Website has the technology (software and hardware) necessary to date for access and/or use thereof. However, and despite the implementation of technical security measures, PAESA does not guarantee the absence of viruses or other harmful technological elements that may cause alterations in the User's computer systems introduced by any means by third parties. Likewise, PAESA states that its Website has been designed, created and implemented by third parties at the request of PAESA, and that it has adequate security systems based on current technology. In order to become a Member of Club PortAventura (hereinafter, Member), the User must purchase one of the passes selected by PortAventura World which, depending on their type, give the holder the right to access to PortAventura Park, PortAventura Park and PortAventura Caribe Aquatic Park or to PortAventura Park, Caribe Aquatic Park and Ferrari Land, on the days and the times they are either totally or partially open to the public and will be able to enjoy the shows, attractions and other facilities, while at all times respecting restrictions on access, operation and safety. The passes may be purchased at the Club PortAventura Office or on this Website using the corresponding application form. Purchasing the pass implies acceptance of the Operational Terms and Conditions of PortAventura Park, PortAventura Caribe Aquatic Park and Ferrari Land, and therefore total compliance thereof during the visit to the PortAventura World facilities. Operational Terms and Conditions are duly on display to the public on information notice boards and they are also available at the Visitor’s Centre and the Guest Service desks in the Hotels as well as on this Website. Registration of a minor as a Member must be done by his or her legal representative, who will be responsible for care of the minor as well as for including any personal information of the minor which might be required in order to process the appropriate application. The price of the passes will depend on the age of the User applying. The prices of the passes will be those which appear on the Website at the time of purchase. Once the pass has been received under the conditions mentioned in the above paragraphs, the User will be able to fully enjoy the advantages of being a Member. Membership ceases when a Member no longer owns one of the PortAventura World passes. PAESA may, at any time it considers appropriate, offer information on its offers of employment via the Website. The User, if interested in any of those employment offers, may register using the space provided for that purpose on the following Web Page: https://www.portaventuraworld.com/nosotros/trabaja-con-nosotros. The User may also complete an employment application form included on the Website, where some personal information will be requested. PAESA reserves the right to neither accept nor process incomplete applications. PAESA clearly states that employment offers included on the Website are intended only to inform any people who may be interested in them. In this sense, neither the employment offers which appear on the Website nor the sending of the application form by the User will imply any undertaking or pre-contractual nor contractual employer/employee relationship of any kind between PAESA and the User who is applying. In addition to this, employment offers supplied by PAESA through the Website may be withdrawn at their discretion, either due to the post or position being filled or merely because the offer is withdrawn. The User declares, under his/her own responsibility, that all the information supplied on the application form is accurate, true, complete, precise and that it refers to the person applying. The Website contains information regarding the booking of holiday accommodation at PortAventura World. Staying at one of the Hotels at PortAventura World gives the right to enter PortAventura Park as many times as you wish and to enjoy the special access conditions for Caribe Aquatic Park. Clients staying at the Hotels at PortAventura World may also take advantage of a special price for a ticket to enter Ferrari Land, all of which is subject to the respective Operational Terms and Conditions. Please consult the Website for these conditions. It is hereby stated that the facilities may be enjoyed according to their opening dates and times and subject to the availability of places. 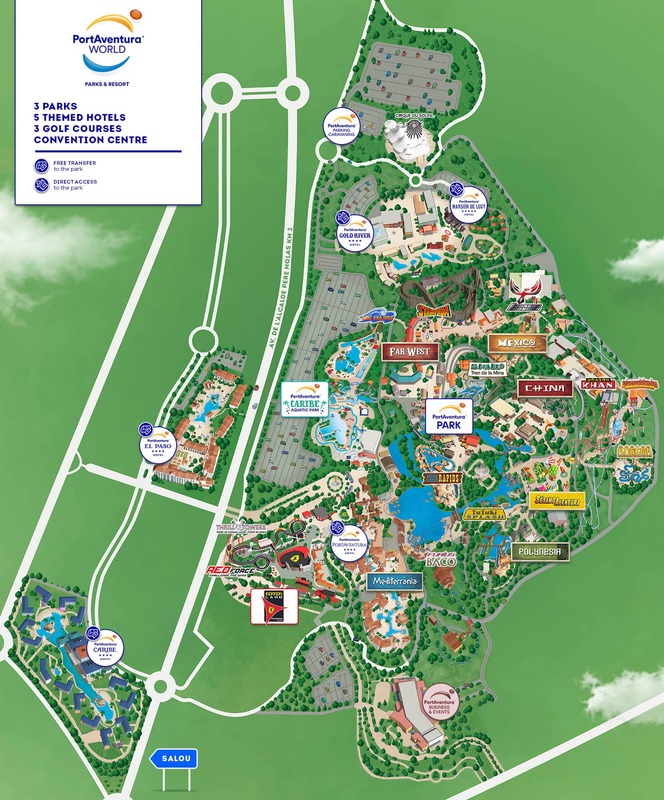 It is hereby stated that access to PortAventura Park, Ferrari Land and PortAventura Caribe Aquatic Park depends on those parks being open and places being available. Similarly, on days that the facilities at PortAventura Park, Ferrari Land and/or PortAventura Caribe Aquatic Park are closed to the public, either totally or partially, for the purposes of these Specific Conditions, accommodation will be understood to mean only the stay at one of the hotels at PortAventura World, and, if applicable, the park or areas which are open. Bookings for holiday accommodation made through the Website are subject to the specific conditions for the booking of holiday accommodation, which may be consulted during the booking process, notwithstanding the contents of these General Conditions. The prices applicable to accommodation reservations will be those which appear on the Website at the time of booking, depending on the dates and other specific circumstances of each booking. The User may consult the conditions for booking the accommodation at the hotels in PortAventura World during the booking process. The User may purchase tickets for PortAventura Park, Ferrari Land and PortAventura Caribe Aquatic Park through the Website. The types of ticket the User can purchase will be those which are available at any given time on the Website. The purchase of tickets for PortAventura Park, Ferrari Land and PortAventura Caribe Aquatic Park made through the Website is subject to the specific conditions of the purchase of such tickets as established for that purpose, notwithstanding the contents of these General Conditions. The prices applicable to the purchase of tickets will be those which appear on the Website at the time of purchase and will depend on the dates and other specific circumstances of each ticket type. The User’s rights and obligations, both while purchasing tickets and once they have been purchased, are also subject to these General Conditions and the specific booking conditions and the Operational Terms and Conditions of PortAventura Park, Ferrari Land and PortAventura Caribe Aquatic Park, which may be consulted on the Website and are available at the Customer Service offices of PortAventura Park, Ferrari Land and PortAventura Caribe Aquatic Park. This information may be supplied to any User who so requests it. Suppliers’ portal. This Website provides tools which allow PortAventura professional buyers to enjoy a closer relationship. The Purchasing Platform provides a simple, safe and transparent way of handling all these activities as well as reducing the time and effort needed for these processes. Find out more on this Website under Purchasing Policy as well as what you must do to become a PortAventura World supplier. Travel agencies. On this Website, travel agencies can quickly and conveniently take advantage of the innumerable special offers as a professional at PortAventura World. In order to enjoy these benefits, you must register. Please consult applicable conditions in the appropriate section. PortAventura Business & Events offers a space that is a benchmark throughout Europe where events may be held for groups from 10 to 3,000 people. It is an ideal and versatile space with the necessary tools to hold any type of event, congress, convention or incentive day. The user may consult the specific conditions for this product in the appropriate section. PortAventura World either owns or has been authorised to use all the www.portaventuraworld.com content on the Website (including, but not limited to, databases, images, drawings, graphics, text files, audio files, video files and software) and this content is protected under national and international intellectual and industrial property law. PAESA either owns or has been authorised to use the compilation (understood as the collection, organisation and assembly) of the entire content of the Website content and it is likewise protected under national and international intellectual and industrial property laws. PortAventura World and its trademarks are registered trademarks of PAESA. The names of other products, services and companies appearing herein or on the Website may be registered trademarks of their respective owners. Any other use of the Website’s content or its design, layout or display, including, but not limited to, the reproduction, modification, distribution, marketing, transmission, subsequent publication, display or total or partial representation thereof, whether for commercial or merely informational purposes, is strictly prohibited. It is PAESA’s policy not to accept creative materials, ideas or suggestions except where expressly requested so as to avoid confusion in case of similarities between ideas submitted by Users and ideas developed by PAESA. Therefore, we kindly request that you not submit any type of original material or idea. Any communication of this kind will not be treated confidentially and may be used by PAESA for any purpose, including, but not limited to, reproduction, modification, distribution, marketing, transmission, subsequent publication, display or total or partial representation thereof. The Website may offer Users technological linking mechanisms, including, but not limited to, hypertext links, banners, buttons, directories and any other search tools that allow the User to access websites other than the Website, including third-party websites (hereinafter, “links”). The installation of these links is intended solely to provide Users with access to information offered by third parties. Such links do not imply that PAESA controls, accepts and/or approves of the content or services offered through the links to the User. Therefore, the User must take the appropriate precautions when evaluating and using such links, and PAESA shall not be liable for the information, data, files, products, services and any other type of material contained on the pages that can be accessed through them. The inclusion of links of any kind to other websites does not imply that PAESA promotes, supports, warrants or recommends those sites. The links or connections on PAESA's Website are offered solely for informational purposes and do not imply any assessment whatsoever regarding the content, ownership, services and/or products offered on those websites. No link, as defined in the foregoing clause, established between any website and the Website shall imply, solely through its existence, any legal relationship whatsoever between the Website and the website containing that link, or knowledge and acceptance by PAESA of the existence and content thereof. PAESA neither warrants nor assumes any liability whatsoever for any damages caused as a result of the use of the services and content offered on a website containing a link to the Website. Claim forms are available to the User from PortAventura World’s Guest Service. The User may submit any complaints or claims to the postal address or e-mail address indicated in section I of these General Conditions of Access and Use, as well as through the following contact form (click here). Likewise, the User as a consumer may request an out-of-court settlement of disputes, in accordance with Law 7/2017, of 2 November, by which Directive 2013/11/EU, of the European Parliament and of the Council, 21 May 2013, is incorporated into the Spanish legal system, regarding the alternative resolution of consumer litigation. You can access this method through the website: http://ec.europa.eu/consumers/odr/. Should any clause of these General Terms and Conditions be declared entirely or partially invalid or unenforceable, said invalidity or unenforceability shall affect only the specific provision or portion thereof so declared, and all other parts of these General Terms and Conditions shall remain in force. The affected provision or portion thereof shall be deemed no longer included, except where, due to its essential nature in relation to these General Terms and Conditions, such exclusion would affect the entirety hereof. Given the characteristics of the products on sale (tickets or hotel bookings for a specific use date or period), article 103. l) of The General Law of the Defence of Consumers and Users is applicable and therefore the right to cancel is excluded for the system for the sale of tickets or hotel bookings. For any legal issues which might arise, the parties will be subject to the jurisdiction of the Courts and Tribunals of Tarragona in the case of companies, and in the case of consumers and users who are individuals, to the jurisdiction of the Courts and Tribunals that are established according to applicable regulations regarding geographical distribution of legal proceedings and the protection of consumers and users. © Port Aventura Entertainment, S.A.U. All rights reserved.